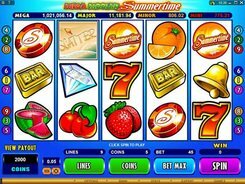 Mega Moolah Summertime is a 5-reel progressive slot available to every player who spins the reels in this fate-changing game. 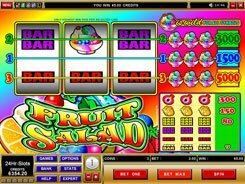 Devoted to a summer time theme, the slot features an array of classic Vegas-style and fruit symbols. 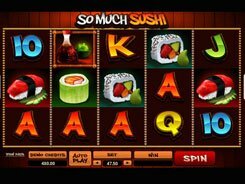 Besides, the slot has a scatter, a wild, free spins and a fixed $2500 jackpot. 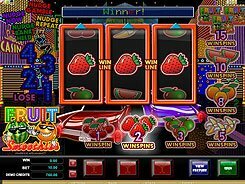 Five scatter symbols trigger 15 free games at a x3 multiplier. A bet per spin ranges from $0.09 to $2.25, with all paylines enabled, yet low-limit players may bet as low as $0.01. A progressive jackpot that is part of the Mega Moolah progressive network is awarded at random regardless a size of the bet you have placed on that jackpot-triggering spin. 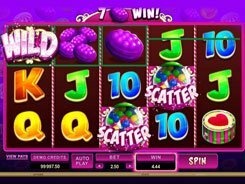 Mega Moolah consists of four progressive jackpots that differ in starting values. Mini, Minor, Major and Mega start at $10, $100, $10,000 and $1 million respectively. 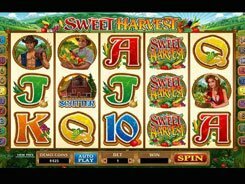 This means that after any jackpot has been hit, it does not start accumulating again from zero, but from any of the four start-up jackpot amounts specified above. PLAY FOR REAL MONEY!